Although the word German was used by the Romans relating to a tribe in that area, the area known now as Germany has evolved over a long period of time into its modern form. The Holy Roman Empire was split into three parts by Charlemagne at the Treaty of Verdun in 843 AD, each of his three sons getting one part. Louis the German received the eastern part corresponding roughly to modern Germany, although nominally still subject to his brother Lothair I who received the Low Countries and retained the Imperial title. For many centuries Germany was in actuality a large number of states, some large, others small, and power rested mainly with the lords of each state. The Hapsburgs attempted to unify Germany ending in the thirty years war 1618 - 1648, which devastated the German economy, and heightened the localisation of power. At this point it is estimated that there were as many as 1,800 separate states some with a population as few as 300 people. Otto von Bismarck was instrumental in unifying most of these states into a modern nation. On April 14th 1871, the king of Prussia, the largest and most powerful state become emperor William I . According to Krause, the new nation consisted of 4 kingdoms, 6 grand duchies and principalities, 3 free cities, and the province of Alsace-Lorraine. 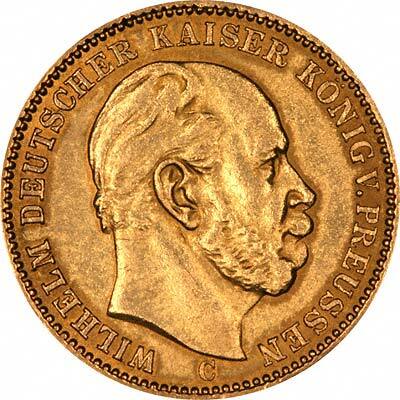 Although Bismarck created a central bank, a unified legal system, and a common currency, individual states were still entitled to issue gold and silver coins with denominations over 1 mark, and the smaller currency units were issued by the empire. The mark had long been a unit of account in much of Europe being equivalent to two thirds of a pound. Before unification German states issued gold coins using many different standards including ducats, goldgulden, carolins, gulden, thalers, krone, maximilians (d'or), fredericks, friederichs, wilhelms, pistoles, pistolens, franks (franken), karolins, with multiples and fractions. Even though there is such a variety of denominations, only about 40 of the states ever issued gold coins, many of them using coins of a neighboring state. Since 1871, the standard gold coins has been 20 marks, although 10 marks and 5 mark coins were also produced, but in smaller quantities. 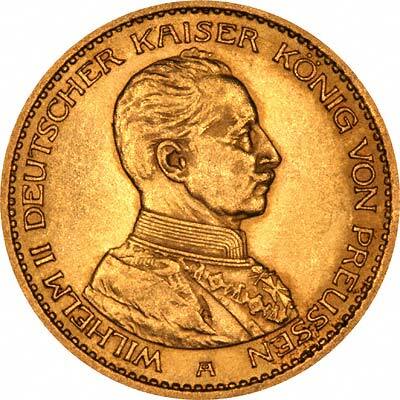 The most prolific state for issuing coins was Prussia, as the largest, wealthiest and most influential, so that the most commonly encountered German gold coins are the 20 mark pieces of Prussia. These were issued from 1871 to 1915. 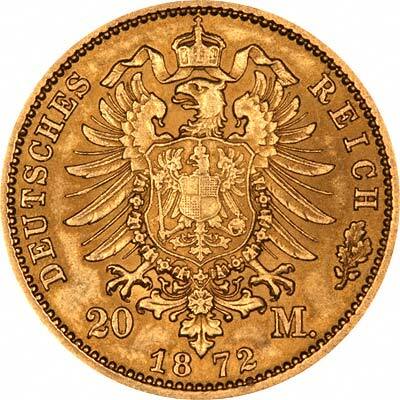 With the exception of patterns, medals and proofs intended primarily for collectors, no gold coins have been issued by Germany since 1915. None at all were issued for the Third Reich (1933 - 1945). Type issued from 1890 to 1913 inclusive. Bare head of King Wilhelm II facing right. Crowned arms of Germany, a spread eagle. This list is for the modern Federal Republic of Germany. For older mint letters, please refer to our German States page. 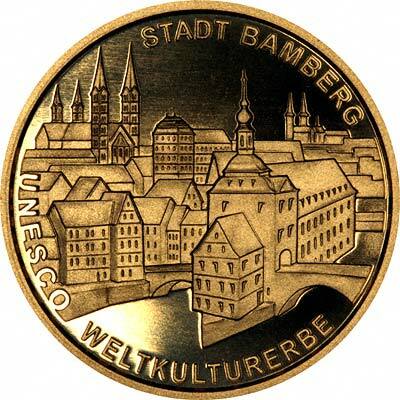 We make an active market in almost all world coins, gold or otherwise, including German gold coins. If you have any of these coins to sell, please contact us, or post them to us for appraisal and offer.